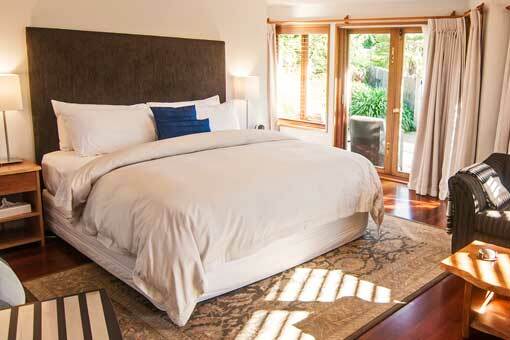 Experience the Bay of Islands’ most elegant five star Bed & Breakfast accommodation. The Bay of Islands is New Zealand’s sub tropical, aquatic playground. Kerikeri is home to New Zealand’s oldest European settlements. All our suites are a minimum of 37 m2(400 square feet). All have access to private outdoor seating in our sun-filled gardens. Curl up with a good book in our private guest lounge; available for your exclusive and private use. A hearty breakfast, made from local fresh produce is included in all our rates. Our intimate lagoon pool offers a luxurious dip during summer. Each room has it’s own private entrance onto the pool garden. Understated elegance nestled among expansive, sub-tropical gardens. Moon Gate Villa is a five-star, quality assured bed and breakfast, inspired by the shape of Cupid’s bow and located in the heart of the Bay of Islands, Northland. Our three delightful suites, are set within secluded gardens, waterfalls and reflective pools. Two minutes from Kerikeri village; close to local restaurants, wineries, galleries and craft shops. A short drive south-east to bustling Paihia and Waitangi, or head north to stunning and secluded bays and beaches. 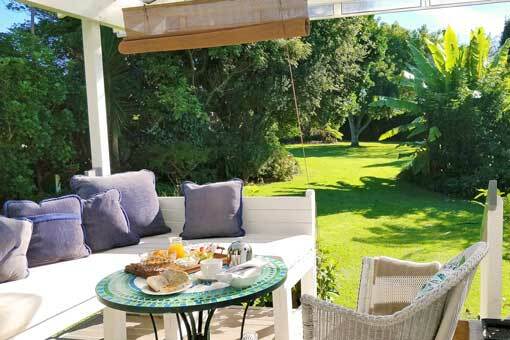 A little more private than a traditional Bed and Breakfast; Moon Gate Villa is a very special accommodation option for travelers to the Bay of Islands, New Zealand. With a full size bathroom ensuite (complete with a deep bath), a king size bed and stunning views across our terrace pond and gardens, the Premium Suite offers an indulging experience with a private sunning area and gate into the adjacent pool. The Premium Suite: for that special occasion, or simply because you deserve it. Perfect for two – or three! Overlooking it’s own ‘zen’ and secret garden, the Deluxe Suite offers the same high standards with a King bed, but with an adjacent king single room, sharing the marble ensuite bathroom. Perfect for two; or three! With space for that extra member of your group who enjoy their own king single room, complete with its own TV/entertainment system and entrance. Nestled in a private corner of our sub-tropical gardens, the cottage enjoys its on views across the gardens, and features a sun-lit outdoor room, complete with cuddle-couch and a dining setting for two. Whilst Premium and Deluxe guests breakfast in the dining room, we provide a breakfast selection from our continental buffet the evening before, for cottage guests to enjoy at leisure in the morning.